Klaus Krippendorff is an influential figure in communication studies widely known for his award-winning book Content Analysis. Over the years, Krippendorff has made important contributions to the ongoing debates on fundamental issues concerning communication theory, epistemology, methods of research, critical scholarship, second-order cybernetics, the social construction of reality through language, design, and meaning. 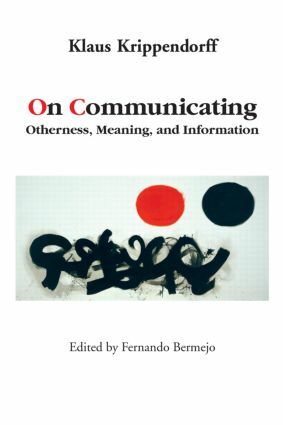 On Communicating assembles Krippendorff’s most significant writings – many of which are virtually unavailable today, appearing in less accessible publications, conference proceedings, out-of-print book chapters, and articles in journals outside the communication field. In their totality, they provide a goldmine for communication students and scholars. Edited and with an introduction by Fernando Bermejo, this book provides readers with access to Krippendorff’s key works.